At Five Lions Heating & Cooling we don’t let improper ductwork steal your energy savings! Our qualified professionals are here to make sure that your home is getting the proper ductwork it needs. The duct system in your home is used in heating and cooling your home through air distribution to various rooms. Ductwork is an unnoticeable system neglected by home owners as it is often hidden within walls, floors, basements and ceilings. A duct system is made of round or rectangular tubes. Ductwork is constructed of sheet metal, fiberglass board, or a flexible plastic and wire composite. A typical duct system loses 25 to 40 percent of the heating or cooling energy put out by a furnace, a heat pump, or an air conditioner. Homes with duct systems in a protected area such as a basement may lose somewhat less than this percentage. Other types of systems such as attic ducts in hot, humid climates will often lose more. A duct system can make a big difference in both the cost and the effectiveness of heating and cooling your home. When ductwork is sized wrong, or in a decrepit state and missing in some spots, your heating and air conditioning bills could be unusually high. Not only the cost but an improper duct installation can have poor effects on the health of the occupants in your home due to indoor air pollution. 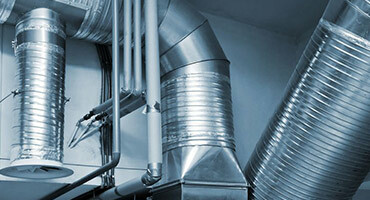 Changes and repairs to a duct system should always be performed by a qualified professional. At Five Lions Heating & Cooling we are the right fit for your duct system. We work with our customers to make sure you’re getting the right duct work for your home. Our trained staff can install and even custom design your ductwork. We offer convenient and flexible hours to better suit your needs. We are here to make sure you receive quality products for the best prices. Call Five Lions Heating & Cooling now and schedule your appointment today. Let us redirect your duct system!